Charles Darwin is an English naturalist who is best remembered for his Theory of Evolution. In 1858, some of Darwin's writings were jointly published with a paper by Alfred Russel Wallace who had independently conceived of the theory of evolution. 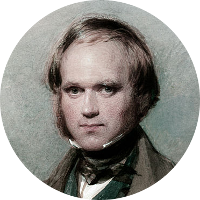 Russell's paper prompted Darwin to publish his ideas in On the Origin of Species in 1859. Although originally met with skepticism, Darwin's ideas came to be generally accepted by most scientists. Charles Darwin has a large number of famous kin, many through his connections to royalty. He is a descendant of King Edward I and a number of Magna Carta Sureties. Other royal connections include King Henry VIII and a number of his wives. He also has connections to the current royal family through Queen Elizabeth II. Charles Darwin has a number of Presidential connections including, but not limited to, Franklin Roosevelt, Thomas Jefferson, Calvin Coolidge, and both Presidents Bush. A number of First Ladies have kinship including Lucretia Garfield, Mamie Eisenhower, Abigail Adams, and Eleanor Roosevelt. Celebrity kin include Ted Danson, Britney Spears, Humphrey Bogart, and Katharine Hepburn. Josiah Wedgwood was the grandfather of Charles Darwin. He is credited as the founder of industrialized pottery manufacturing and the inventor of the pyrometer, a device to measure extremely high temperatures. He invented the device to measure the temperature in his kilns. Josiah Wedgwood was also a prominent abolitionist and he is often remembered for his “Am I Not a Man And a Brother?” anti-slavery medallion. The medallion depicted the seal for the Society for Effecting the Abolition of the Slave Trade.